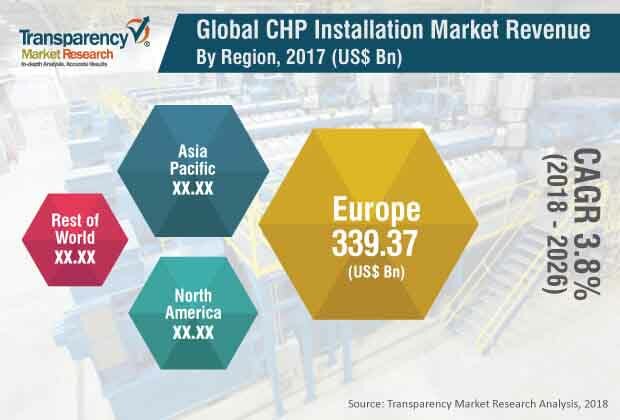 According to a new market report “CHP Installation Market – Global Industry Analysis, Size, Share, Growth, Trends, and Forecast: 2017–2026” released by Transparency Market Research, the CHP installation market was valued at US$ 806.2 Bn in 2017 and is projected to reach US$ 1131.4 Bn by 2026 at a CAGR of 3.8% from 2018 to 2026. Cogeneration or combined heat and power (CHP) is the use of a heat engine or power station to generate electricity and heat at the same time. The primary purpose of CHP installations is to transport heat and electricity for power transmission. Cogeneration is a more efficient use of fuel. Newly developed state-of-the-art CHP installations offer better reliability with efficient results. CHP installations prove to be highly cost effective. They lower harmful greenhouse gas (GHG) emissions and provide more efficient use of natural resources. CHP installation improves power reliability and self-sufficiency. It is capable of operating on renewable or nonrenewable resources. Cost reduction in the manufacturing process is one of the benefits of cogeneration methods over the conventional energy generation methods. Government subsidies and financial incentives are provided to users through the means of feed-in-tariff, Self-Generation Incentive Program (SGIP) and investment tax credits. New cogeneration plants are equipped with the latest technologies, which are designed to improve efficiency and adhere to emission control standards. These equipment focus on environmental safety and provide reliable operations. The global CHP installation market can be primarily segmented into four categories: fuel, prime mover, application, and region. In terms of fuel, the CHP installation market can be classified into biomass, coal, natural gas, and others. Natural gas is a widely used fuel for CHP installation. In terms of application, the global CHP installation market can be bifurcated into commercial & residential and industrial. The different types of prime movers of CHP installation are steam turbine, combined cycle, gas turbine, reciprocating engine, and others. CHP installations with modern steam turbines have electric efficiencies between 30% and 40%. Compared to combustion turbines and reciprocating engines, steam turbine-based CHP is more expensive to obtain and operate, largely due to costs associated with the boiler. Increase in population and need to meet the demand for energy have propelled the demand for CHP installations. Steady rise in the oil & gas prices has created opportunities for the use of CHP installation. Rise in demand for energy consumption due to the increase in population and growth in environmental concerns have propelled the demand for CHP installation in the renewable energy. Many countries have made investments in offshore wind energy projects. This is ultimately boosting the CHP installation market. Countries surrounded by coastline and water bodies are also taking efforts to generate energy from tidal, wave, and hydro power. This is likely to augment demand for CHP installation. Governments across the globe have implemented policies and introduced programs and subsidies to promote the use of cogeneration. Additionally, economic recovery in Europe, rapid urbanization in countries such as India and China, increase in disposable income of the people, and growth in government efforts to provide social housing are expected to drive the residential buildings sector. This, in turn, is anticipated to propel the CHP installation market. In terms of value, the CHP installation market in Asia Pacific and Europe is estimated to expand significantly during the forecast period. Increase in infrastructure activities and government initiatives for infrastructure development are projected to drive the market during the forecast period. Increase in focus on renewable energy, such as solar, wind, small hydro, is a major restraint of the CHP installation market. Other technologies are cleaner forms of power and electricity generation, while CHP is considered an ideal option for heat generation and power production. CHP is very flexible and could be customized according to the requirements on each site. It can be used across a wide range of sectors and provides cost-effective energy solutions for large and small energy users. Key players operating in the CHP installation market are expected to benefit from the formation of strategic alliances with global players. Prominent players functioning in the CHP installation market include Siemens AG, 2G Energy Services, General Electric Company, Cummins Inc., Wartsila, and Cummins Inc.